Basin and Bay Area Stakeholder Committee and Expert Science Team for the Brazos River and Bay and Estuary System. Meetings, links to member lists, recommendations, work plan documents, and previous meeting agendas and presentations. The Brazos BBASC was appointed by the Environmental Flows Advisory Group (EFAG) on October 1, 2010. The Brazos BBEST was appointed by the BBASC on March 1, 2011. 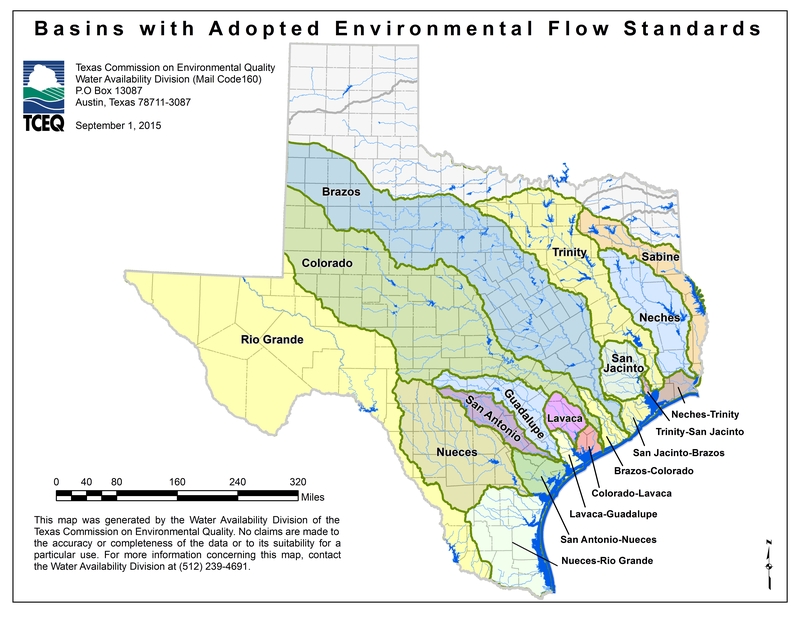 On February 12, 2014, TCEQ adopted environmental flow standards for the Brazos River and its associated bay and estuary system. For more information see the Environmental Flows Rules Web page or view the basin rules [30 TAC, 298(G)]. The 83rd Texas Legislature appropriated $2,000,000 to the Texas Water Development Board (TWDB) for the continued study of environmental flows and instream flows for Texas river basins. The 84th Texas Legislature appropriated $2,000,000 to TWDB for the continued study of environmental flows and instream flows for Texas river basins.